ISLAMABAD, Aug 14 (APP):To mark the 71st anniversary of Independence Day of Pakistan, a flag hoisting ceremony was held at Pakistan High Commission in Dhaka on Tuesday where a large number of Pakistan community in Bangladesh, officers, officials and their family members participated in the ceremony. 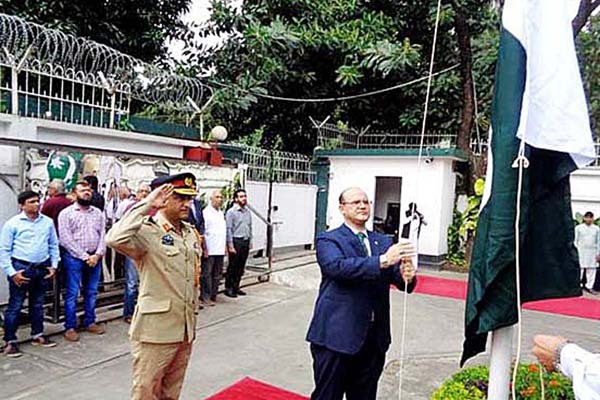 Pakistan National Anthem was played while the Charge d’ Affaires Shah Faisal Kakar hoisted the national flag. The messages of the president and prime minister of Pakistan were read out. Charge d’ Affaires Shah Faisal Kakar, in his speech, felicitated the Pakistani community on the auspicious occasion of the Independence Day of Pakistan. He emphasized on the need of collective efforts to achieve the ultimate goal of the creation of a separate homeland for the Muslims of sub-continent which was only possible by following the golden principles of “Faith, Unity and Discipline” as laid down by the Father of the Nation, Quaid-e-Azam Muhammad Ali Jinnah. He remarked that under the great leadership of Quaid-e-Azam our forefathers achieved homeland for us and now it is incumbent upon all of us to serve and safeguard the national interest of Pakistan.